You’ve heard the story before: in the not-too-distant future, robots will rule our lives. Automated entities will inhabit our homes, help out in our schools and workplaces, take over most unskilled trades, and even perform delicate heart replacements. Eventually, these robots will gain sentience, turn against their creators, and exterminate the human race. Yet even this fictional horror may be less chilling than the vision of the not-so-distant reality depicted by Wallach and Allen in Moral Machines. In this book, on a day in 2012, cascading blackouts hit the East Coast. Detecting the blackouts as a possible terrorist action, national screening software sets itself to the highest security level, triggering airport lockdowns and forcing plane landings. In the confusion, two planes collide, killing the planes’ crew and passengers. Lives are lost, but not one “evil” sentient robot is involved. In fact, the machines do not even know what they are doing. In following a perfectly logical set of rules, these computers bring complete disaster to a nation. Yet what if we could create artificial moral agents (AMAs), robots capable of making ethical decisions? This question then raises two others. First, do we need AMAs? Second, if we do, how can we go about creating them? In Moral Machines, the authors discuss the inevitability of AMAs, what it means for a robot to be moral, the best approaches to creating an AMA, and the legal and ethical implications of such creations. 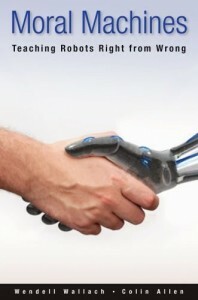 Each chapter is an intriguing, well-researched case study of a robot or conceptualized AMA. Though the book is heavily skewed to an engineer’s perspective, the discussion occasionally strays into philosophical territory. It is here when the authors handle the segues a bit too methodically. As a result, the reader walks away with few important conclusions about the philosophical nature of morality or self-awareness. Still, Moral Machines makes an important statement about the necessity of integrating top-down and bottom-up approaches in the implementation of an AMA. In addition, this book also raises a host of provocative questions that go beyond the ones put forth earlier. For instance, are we comfortable allowing robots to make any decisions of significance in our lives? At what point do robots become “human?” Is it when they understand the consequences of their actions – or perhaps gain self-awareness – or still perhaps feel pain? And ultimately: can we as a species deal with the effects of decisions that are not our own?